When I re-read the last post, I realized that I written nothing about the many attempts to save our home in those last months. We did not sit idly by. Many good people stepped up in an effort to help. When I first defaulted, the bank sent me a letter stating that if I paid $8,000 on the loan that they would refinance the remainder. A friend of a friend called me and told me not to worry – that he would come up with the money for the refinance. A stand of timber was being sold and the money from the sale would be put on the house. This unfortunately did not work out; the timber deal fell through. Also, the bank asked for an income statement from me and deemed my income inadequate for the refinancing. I went to many places to ask about work, but was told I needed to apply online. I received neither calls nor e-mails. It was frustrating and depressing. Impossible to get hired when no one will call you for an interview. After this, my oldest daughter 220 miles away went to get a loan to buy my property. The payments would have been approximately $200 a month. She called me several times to let me know the paperwork was going through and then one day I answered the phone to someone crying. The loan was denied, even though her income was more than adequate, for she was one who pays in cash. She did not have bad credit, just NO credit history. And as this home would have been her “second home”, the loan was not approved. My heart broke to hear her distress, for she had done all she could to help. Another plan that did not work out. We were boarding a horse for a family down the road. 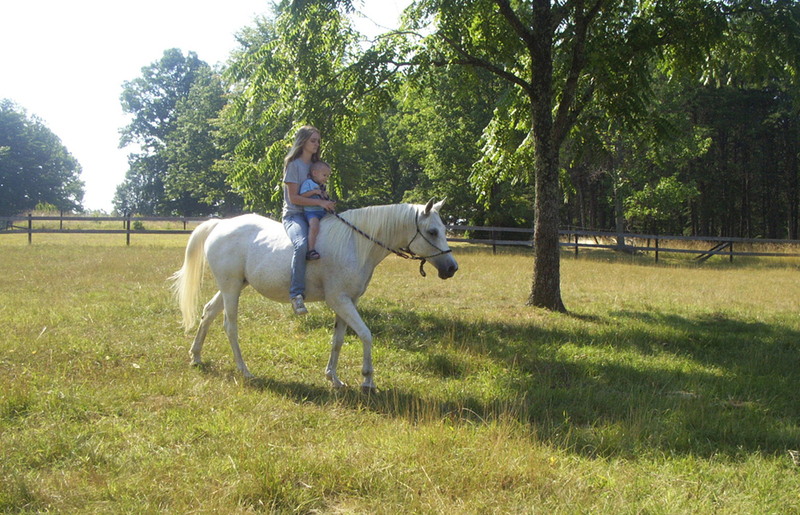 They had purchased a horse that had many health problems and Angel was with us while my daughter Megan doctored her and while her owners put up a fence. John (name changed) had just heard that we were going to lose the house. While we were standing at the fence watching Megan treat Angel’s hooves, he told me that he would buy my six acres with the barns and house for the $25,500 owed to the bank and Megan and I would be able to stay there. He told me he sure wouldn’t mind owning it, and that it would be a good investment for him. John said for me to give him a couple days to work out details, and not to worry. Two days later John was again leaning on the gate as I walked outside and sadly told me how sorry he was, but that the night before he received a call. A big contract had just fallen through. He would not be able to buy the house. I thanked him with all my heart for trying, for his kind offer. Each time my hopes were soaring, and as one idea after another failed, my heart broke. I was on the phone every day calling places in the town, government agencies looking for some type of aid. All to no avail. Someone told me about an online “help” site, so I started an account and told the story of my dilemma. Kind strangers ( I made some wonderful friends the years I remained on that site) as well as friends of mine helped us to keep gas in the car and the phone paid, but the huge miracle I needed to keep our home was not forthcoming. It was over. There was nothing left to do but contact a realtor and list it at a super low price, hoping to have a couple thousand instead of allowing the bank to auction our beloved home and leave empty handed. So people gathered on the courthouse steps the morning of the auction to bid on my home, but no bidding took place, as a sales contract was signed the evening before. This is a photo of Valentine, Megan and her nephew Gavin in one of our pastures on the farm.